February is our hottest month – the peak of summer - this year has been unusually warm with mid day temperatures in the high 30's C - and it is continuing into our Carnaval long weekend ( March 5 - 8, 2011 ). Celebrated right across South America this is the biggest festival each year. A time of masquerade, excessive eating, drinking, music and dancing. Up all night, night after night. Dancing 'til dawn...then starting all over again at sunrise! For a brief history on the origins of carnival see last years post. On this holiday long weekend thousands have again made a break for the beaches for some fun and rest. Many interior cities resemble " ghost towns. " Coastal accommodation is scarce with homes and apartments swelling with occupants. Mattresses cover any available floorspace, and still many others sleep in hammocks. During this long weekend social boundaries and ethnic and gender differences vanish as people have fun together. Diabillios, young and old, seek out their unsuspecting targets with water squirt guns, a shaving cream spray , or a water balloon or bucket bath. Rays of sunshine fill the warm festive days making the beaches a pleasant and fun diversion. An army of red & white Penguino ice cream bicycle carts patrol the beaches, malecon, and local streets. The Navy and the National Police have increased uniformed personal for patrolling and crowd control. The Civil defense, Firemen and paramedics have established numerous emergency stations. The beer lorry's are unloading thousands of crates at the many newly established stands and stalls along several miles of beach and malecon which will serve as bars & eateries. And several major event stages have been set up for artist performances, presentations, and dancing bands. Leonidas Plaza has an extensive agenda of activities ( including surfing, beach volleyball, and soccer tournaments ) focused on the beach of Punta Bellaca, San Vicente, Briseno, and Canoa also have many events. On Friday the opening parade kicks off festivities with a bang. Saturday evening's gala had 12 ambassadors from coastal communities vying for the title "Carnaval Queen for the coast of Ecuador". The beautiful contestants represent Guayaquil, Esmeraldas, Portoviejo, Manta, Jipijapa, San Vicente, Leonidas Plaza, & Bahia de Caraquez. Ms Vanessa Loor was proclaimed the new Queen of the Carnival for Bahia de Caráquez. 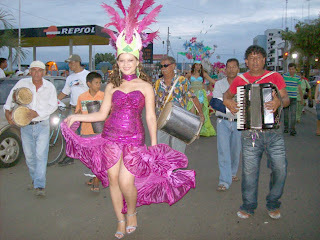 Each candidate models their carnaval suit of fantasy, and a bathing suit. There was also modeling of a line of swimsuits by a local modeling agency. There is such an influx of activity in town that we experienced two power outages that evening each lasting about 30 minutes. The silence from the music was deafening, and the now pitch-black evening sky filled with many bright stars. Sunday evening featured a variety of musical artists sponsored by Sunset purified water, and the municipal tourism board. Minongo, and the Kimba Girls. Recently the government enacted legislation prohibiting the sale of alcohol on Sundays, and restricting the opening hours of bars - this was either lifted or the enforcement ignored for Carnaval weekend. The main stage on Monday March 8th three musical groups with different repertoires and styles were presented. First we enjoyed the classical rock tunes by "NS7"; then Heavy Metal of " Detonation" - not so much; finally the orchestral set "Portoviejo New Band" celebrating Carnaval. Dancing, and cauldrons of tropical fruit liquor, grilled chorizo and other festive food was enjoyed by all. This long weekend was more importantly a gathering and social time for families. Many traveled many miles from throughout South America and Europe to be together for the four days. Large tables and shade tents could be found in many homes where conversation, card games, water games, bar-b-qued food and music filled the day. Local authorities published, and announced, a plea to the people who offer the services of lodging, feeding, transport and other necessities, not to abuse prices and to provide the tourists the best possible treatment. This will be the first Carnaval in Bahia since the bridge has been completed - which has facilitated higher volumes of traffic. 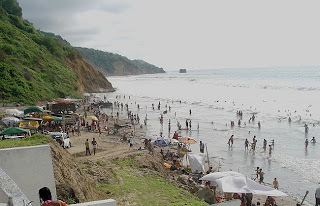 San Vicente & Canoa on the northern coast seem to have drawn much higher volumes of tourists on this long weekend much to the chagrin of local merchants. In fact most mornings there was two lanes of traffic backed up for several miles into Leonidas Plaza, merging congestion for the single entry lane onto the bridge. 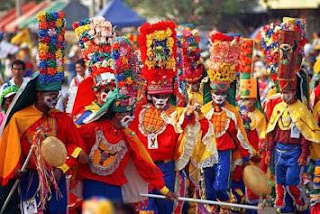 Many popular festivities are held in different regions of the country. In Ecuador the most famed carnival festivities are in Ambato - "Fiesta de las Flores y de las Frutas ." And if you would like to escape and view some awesome photos from Rio De Janeiro's 2011 Carnaval the grandaddy of them all ! If you might be considering visiting South America for a future Carnaval, you should book your accommodation well in advance.